Wolseley Viper 6 cylinder saloon. Old adverts are great, as their wording and style echo the time perfectly. 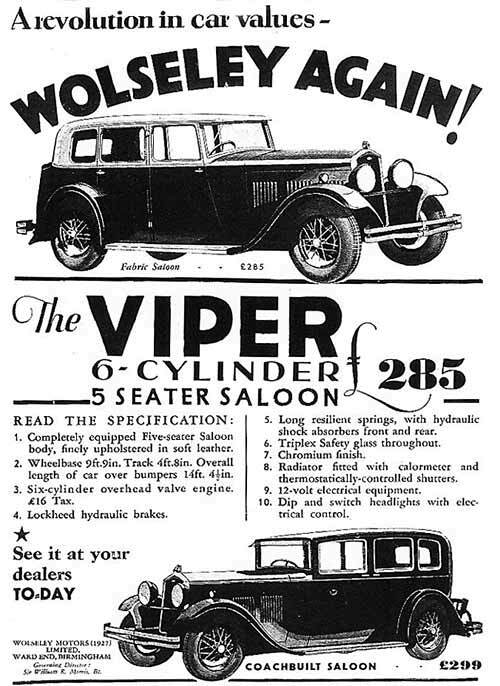 The ad shown below, sent in by Les, shows a splendid Wolseley Viper 5 seat saloon car. The specification pitched the Viper in the quality car sector of the market, somewhere above the run-of-the-mill saloons from the volume car producers. The interior was trimmed throughout in leather, a feature as popular then as it still is today. The engine was of the overhead valve design, with 6 cylinders. Braking was by Lockheed hydraulics - many thirties car still managed with rods and cables, so hydraulics was quite a refinement in those days. Triplex Safety glass was also given a mention, showing that some thought was given to occupant safety in the 30s, if not exactly a lot. The radiator was fitted with a calormeter, and the grille bars, or shutters, were thermostatically controlled - no ugly grille muffs were required in the winter then! The electrics on this fine Wolseley were 12 volt (6 volt was still commonplace in the 1930s). Prices for these Wolseleys began at £285 for the 4 door fabric saloon, and the coachbuilt Viper saloon cost £299. Unlike in modern-day advertisements, the manufacturer's address is given (Wolseley Motors (1927) Limited, Ward End, Birmingham), as is the 'Governing Director', a certain Sir William R Morris. Do any Wolseley Vipers still exist?